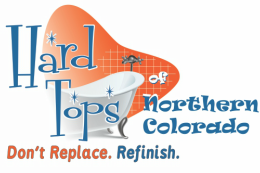 Hard Tops of Northern Colorado has been serving Fort Collins, Colorado and the surrounding communities by providing quality refinishing and remodeling products and services for residential and commercial clients since 2005. We carry high quality products and guarantee exceptional service and proper installation. Our refinishing products and services provide an attractive, cost effective alternative to replacing your existing countertops, showers, bathtubs and more. Preview our gallery for inspiration for your home or business for more ideas. You do not want just anyone coming into your home. For this reason, it is essential to ensure the company you choose to work with is one you can truly trust. Hard Tops of Northern Colorado has been a trusted name in the industry for years. Honesty and a service second to none has been a trademark of Hard Tops of Northern Colorado since we opened our doors. "My goal is to be the company that Northern Coloradoans go to for all their refinishing needs and along the way build a reputation of a hard working and honest man that will do everything I can to do such a great job, that my customers will feel confident about referring Hard Tops to their friends and family." Hard Tops of Northern Colorado is owned and operated by Michael and Latisha Monnier.